Something went horribly wrong in 1992. Can you fix it and survive? In The Marcy Case, the first expansion to the revolutionary T.I.M.E. Stories system, you and your fellow T.I.M.E. agents travel back to 1992 in search of a missing girl. You'll soon discover as you explore the streets of Rhineland, Wisconsin that there are far worse things happening in this small town than the kidnapping of a child. Developed by Sebastien Pauchon with Nicolas Normandon and featuring original artwork by Looky and Pascal Quidault, this combat-heavy sceanrio offers danger, action, and mystery unlike any version of the 1990s that you may have experienced before. NOTE: You must own the T.I.M.E. Stories base game to play this scenario. 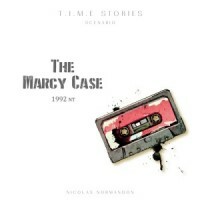 Add a Review for "T.I.M.E Stories: The Marcy Case"